Lukas might only be eight years old but he will definitely be ready when the inevitable zombie apocalypse hits. NBC News' Alan Boyle looks into pop culture's fascination with zombies. How does Danai Gurira keep Michonne in fighting shape for The Walking Dead? One enterprising resident of Sycamore Township in Ohio decided on a zombie theme for his nativity scene and, as you can see in this news report, a few residents, along with town officials, were none too pleased. How do you keep college students from being bored in class? For instructor Glenn Stutzky, the answer was obvious - just add zombies. So in addition to not being bored, MSU students are learning about Surviving the Coming Zombie Apocalypse - Disasters, Catastrophes, and Human Behavior. At New York Comic Con, Comic Book Resources spoke with Robert Kirkman about The Walking Dead, its upcoming spin-off series, and other projects that he is working on. This week's issue of TV Guide Magazine spotlights The Walking Dead, including an interview with Andrew Lincoln and Norman Reedus. This week's edition of Entertainment Weekly spotlights the upcoming season of The Walking Dead and they are taking an opportunity to run four different covers featuring Norman Reedus, Andrew Lincoln, Steven Yuen and Lauren Cohan, and Danai Gurira. Orphan Black's Tatiana Maslany added one more persona to her growing list of identities - Shaun. For the San Diego Comic-Con, The Hollywood Reporter gave Maslany the chance to recreate one of her favorite movie moments for their "Titans of Comic-Con" feature and she chose Edgar Wright's Shaun of the Dead. The Lionsgate Horror Society is accepting new members. Do you dare to join? Sign up now to access member exclusive content, save 15% on horror movie merchandise, and earn points to win prizes every month. And one "Horror Visionary" who is quick enough to sign up during the first month will win the Grand Prize featuring a Lionsgate Horror DVD/BD Super-Pack (6 titles), The Quiet Ones swag pack, a GoPro HERO3+ Silver Edition, and a Professional Special Effects Makeup Starter Kit! Syfy has greenlit a new zombie series titled Z Nation that is being produced by The Asylum (of Sharknado fame). "...Z Nation is set three years after the zombie virus has gutted the country, and a team of everyday heroes must transport the only known survivor of the plague from New York to California, where the last functioning viral lab waits for his blood. Although the antibodies he carries are the world’s last, best hope for a vaccine, he hides a dark secret that threatens them all." Z Nation is scheduled to premiere this fall. For the 65th Primetime Emmy Awards, The Walking Dead has been recognized by the Academy of Television Arts & Sciences with two nominations: Outstanding Interactive Program and Outstanding Prosthetic Makeup For A Series, Miniseries, Movie Or A Special. 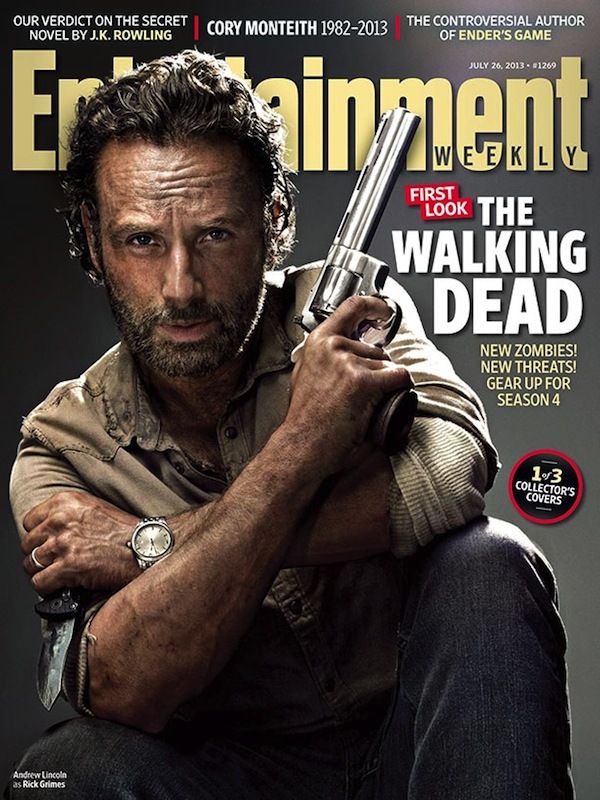 For their latest issue, Entertainment Weekly is featuring a series of three Walking Dead themed "collector's covers". Big news today for Walking Dead fangirls! Ashley Eckstein's awesome Her Universe has partnered with AMC to produce a line of awesome Walking Dead apparel including t-shirts, hoodies, dresses, skirts and more. Items will be begin to be available for purchase on Her Universe on July 18th. Mark that date because you know you want these! Robert Kirkman is re-teaming with FOX International Channels, the international distributors of The Walking Dead, to bring another of his comic book creations to life on television screens. This time around, Kirkman is trading in zombies for demons with a storyline about exorcism. Los Angeles– 4 March 2013 – FOX International Channels (FIC),The Walking Dead Creator/Executive Producer Robert Kirkman, Kirkman's Skybound imprint at Image Comics, and Circle of Confusion are developing a script based on Kirkman’s upcoming comic book series set in the world of exorcism. This partnership emerged from a long-standing and successful relationship between Kirkman and FIC during the ongoing run of AMC’s hit series, The Walking Dead, based on Kirkman's Eisner Award-winning comic book series, on which FIC is international partner. Told through the Kirkman prism, the series follows a young man, Kyle Barnes, who has been plagued by possession since he was a child. Now an adult, he embarks on a spiritual journey to find answers but what he uncovers could mean the end of life on Earth as we know it. Kirkman will serve as executive producer alongside The Walking Dead executive producer David Alpert of Circle of Confusion. Kirkman states, "Sharon Tal Yguado and the entire team at FOX International Channels have been instrumental in making The Walking Dead the worldwide success that it has become. I couldn't resist the opportunity to continue working with this forward-thinking and extremely talented group." “Exorcism has captivated movie audiences all over the world but has never been explored on television,” said Sharon Tal Yguado, EVP Global Scripted Programming and Original Development at FIC. "Robert Kirkman, who forever changed the scope of Cable TV with The Walking Dead, possesses an unparalleled talent of telling big concept stories in a smart and incredibly genuine way. We couldn’t be more excited to be working with him on this project, which we see as a reinvention of the genre." If this project turns out to be half as good as The Walking Dead, we'll definitely be on board with Kirkman for the ride.